Google Group Notifications - How do you want to read this group? I remember when I first encountered Google Groups, I was a bit confused as to what my options were regarding notifications of new messages. To Google's defense, the explanations are pretty straight-forward on screen, but I've noticed that students and teachers alike often get confused as to what their options are for reading the group to which they have just subscribed. 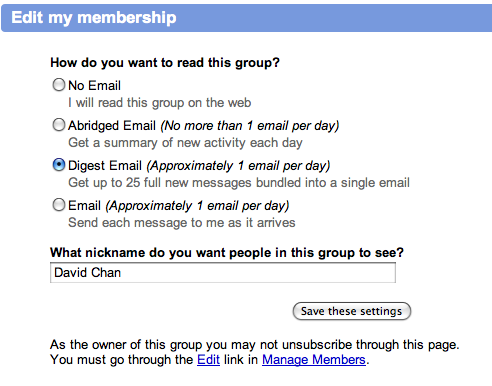 Here's an attempt to clarify a bit more as to how you can choose to interact with your Google Group. This is for those whose email inboxes are overflowing and you really can't be bothered with any more messages. Also, assuming you are interested in the group messages, this is for the user who is constantly checking the group on a regular basis. There's not a need for additional notifications. Just be aware that without notifications, the group will continue with or without you, so make sure you check for updates. 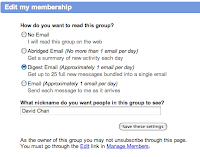 I would recommend this option if the Group has a very large and active membership. If the group gets more than 25 messages per day, it might be beneficial to just get a summary of the new messages. This way, you'll have control on whether you want to read the entire messages, but at least you'll have an idea of what's being discussed. This is my preferred choice for most of the groups of which I'm a member. Each day (usually towards the end of the day), I receive a single email that contains full versions of all of the new messages posted to the group. With the digest, I get to stay on top of new posts without being overwhelmed by constant bombardment of emails and without having to make additional clicks or log-ins to my account. If there's a particular topic that you're interested in, or there's a potential time factor involved, the immediate email option may be the best for you. At first glance, this is the option that I've observed many teachers and students select only to become frustrated when they realize that they are being flooded in their inboxes, especially during the first few weeks when the excitement of the group hasn't worn off yet. Based on my experience, I find that this is just a bit too much, especially if the group turns out to be an active one. Considering the above, what setting do you have your Group fixed at? For those interested in changing their option, one needs to simply click on the "edit my membership" link, and you'll see the options listed above. Select the one that best fits your personal taste for email frequency, and you'll be on your way to maximizing the efficiency of your participation.